BEIJING (CNS) — In a rare move, a top Chinese official answered journalists’ questions about a new white paper on religious freedom and the ongoing talks between his government and the Vatican. Chen Zongrong, former deputy director of China’s Religious Affairs Bureau, said he did not agree that preventing the Vatican from having full control of bishop appointments would hinder freedom of religion, reported ucanews.com. The Religious Affairs Bureau is being subsumed by the Communist Party’s United Front Work Department. Chen said the government was making a concerted effort to come to an agreement with the Vatican on the appointment of bishops. China would select bishop candidates but the pope would have veto power — an arrangement meant to end the appointment of rival clerics. 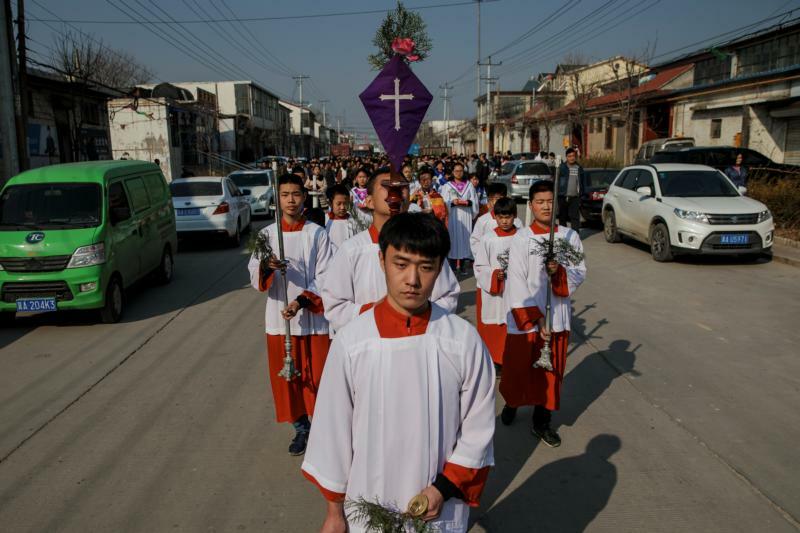 Although many reports speculated the Vatican and China would sign a deal during Holy Week, on March 29, Holy Thursday, the Vatican spokesman said such a deal was not imminent. Chen spoke April 3, after China issued its first white paper on religious freedom in 21 years. The paper was published less than a week after government officials took Bishop Vincent Guo Xijin of Mindong away from his diocese for a couple of days during Holy Week. Ucanews.com reported the white paper was notable for quantifying the number of people who practiced religion at 200 million, double the 100 million in the previous paper published in 1997. It claimed 6 million are Catholics, 38 million Protestants and 20 million Muslims. But other figures released in recent years appear to show the Chinese government is underplaying religion numbers by excluding potentially tens of millions of people practicing all denominations of Christianity outside the official state-run ” churches,” reported ucanews.com. The white paper described party authority over religion as being necessary for China’s independence, saying Western religions such as Christianity “had long been controlled and utilized by colonialists and imperialists.” It also emphasized that Muslim leaders in China must keep their followers clear of extremist views. Ying Fuk-tsang, director of the divinity school of Chung Chi College at the Chinese University of Hong Kong, told ucanews.com that there were no significant new ideas in the white paper, which basically reiterated the key points of President Xi Jinping’s address at the Central United Front Work Conference and the National Conference on Religious Work in May 2016. “As the white paper is not a policy document or a law, it is only a proclamation and a report on [the government’s] position,” Ying said. Ying said Christian numbers are official numbers and it is generally believed that members of underground churches and house churches are not included. Or Yan Yan, a project officer at the Justice and Peace Commission of Hong Kong, said churches were facing crackdowns. People under the age of 18 have also been forbidden from entering churches, she said, and many online shopping platforms in mainland China have had to remove the Bible from their listings. She said the white paper mentioned managing religious affairs according to the law, but the so-called law in China is not to protect religious freedom of citizens but to monitor and control religions. Or Yan Yan said many regulations and laws implemented on the mainland, especially the revised regulations on religious affairs, have completely violated the protection of religious freedom declared in the context of the International Convention on Human Rights. The white paper uses beautiful wording to describe the principle of “independence, autonomy and self-administration,” she added, but noted this principle is primarily not about respecting the inculturation, autonomy and nature of the church but more about destroying the essence of the church and the principle of faith.